The Other Founders (University of North Carolina Press), focuses on the most prominent opponents of the Constitution. The Anti-Federalists or the Other Founders while ultimately unsuccessful in opposing the ratification of the Constitution but played leading roles in both shaping the Bill of Rights and the interpreting the Constitution. 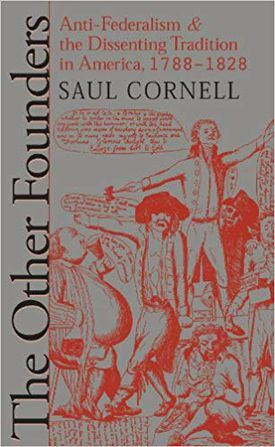 Cornell explains who the Other Founders were, what united them in their quest against the ratification of the Constitution and the role they played in interpreting it after ratification. Essentially three groups of Americans were Anti-Federalists: westerners, middling businessman and southern farmers. While the Anti-Federalists were composed of radically different groups, they made fairly nine fairly consistent arguments against the Constitution’s ratification. They were concerned that the Constitution abolished the Federal character of the United States in favor of the centralized government. The Constitution would undermine the republican nature of the Union in favor the creation of an aristocracy. Individuals were not adequately represented in the House of Representatives and the Constitution dangerous blended the executive and legislative branches. The Constitution created a potentially powerful judiciary that violated basic principles of democracy and undermined states control. Basic rights were not protected because the Constitution lacked a Bill of Rights. The Constitution gave the central government extraordinarily broad powers to tax citizens and it threatened the autonomy of the states. The president’s powers threatened to create an elected monarchy. The Anti-Federalists were divided in their opposition to the Constitution because some believed that the addition of a bill of rights could make it more palpable, while others found that its basic structure was fundamentally flawed. While many of the Anti-Federalists concerns were legitimate, their opposition was hampered by the unwillingness of newspapers to widely publish their arguments and their inability to propose an alternative. Even most of the Anti-Federalists acknowledged that the Articles of Confederation were utterly inadequate. Despite the media’s hostility to the Anti-Federalists, some pamphlets and articles were published. These pieces demonstrated the different groups around the country argued against the Constitution. While most Anti-Federalists agreed on the nine principles listed above; each of the authors emphasized or argued for somewhat different responses to the Constitution. Because Anti-Federalists wrote to different audiences, authors typically shaped their rhetoric for their specific constituencies. After the Constitution was ratified, Anti-Federalists became prominent voices within Democratic-Republicanism. After ratification, several debates strengthened and reinforced Anti-Federalist complaints and concerns made during the ratification process. While the strongest supporters of Democratic-Republican politicians occurred in areas that opposed ratification, Democratic-Republicanism and Anti-Federalism were different. Madison and Jefferson, Federalists during the ratification debate, began to gravitate towards Democratic-Republicanism. Unlike Anti-Federalism, Democratic-Republicanism was better organized and had much wider support among newspapers and political societies. This movement coalesced against Hamilton’s economic programs. While Democratic-Republicans opposed Hamilton’s economic policies, only the most radical and plebian Anti-Federalists supported the Whiskey Revolt. Most Anti-Federalists had coalesced around to goal of forming the loyal opposition to the Federalists. The passage of the Alien and Sedition Acts reinforced many of the concerns Anti-Federalists had about the Constitution. Anti-Federalists were concerned that Federalists would neither respect the freedom of the press nor support jury trials. The Alien and Sedition Acts confirmed the Anti-Federalists views of the Federalists. They were especially concerned that Federalists sought to impose Blackstone’s interpretation of libel and slander. Blackstone’s understanding of libel simply prevented prior restraint and Anti-Federalists believed that this interpretation would undermine a free press because they could be prosecuted for defamation. Additionally, Anti-Federalists were outraged that Federalists sought to minimize the importance of jury trials. The Anti-Federalists strongly favored jury trials and sought to follow the Zenger model. They believed that juries could be used to nullify objectionable laws such as libel. In 1798, after Jay negotiated a treaty with the British, Federalists and Anti-Federalists argued over the “original intent” of framers regarding Congress’s role in ratifying the treaty. Neither side could agree on what was the most important source to determine the “original intent” of the drafters. Anti-Federalists argued that courts should look to the state conventions to determine the original intent of the Framers while Federalists looked to the Federalist papers. Cornell makes it clear that even in 1798 that it was not only it was difficult to determine the original intent to the Framers, but foolhardy. He calls into question attempts by modern jurists to interpret the “original intent” of the Framers. This page was last edited on 4 December 2018, at 13:58.